1 A None No Power Seat 1 A is a standard Economy Class seat that may have slightly extra legroom due to the position of the bulkhead. The close proximity to the lavatory and galley may be bothersome. There is no floor storage during takeoff and landing. 1 B None No Power Seat 1 B is a standard Economy Class seat that may have slightly extra legroom due to the position of the bulkhead. The close proximity to the lavatory and galley may be bothersome. There is no floor storage during takeoff and landing. 1 C None No Power Seat 1 C is a standard Economy Class seat that may have slightly extra legroom due to the position of the bulkhead. The close proximity to the lavatory and galley may be bothersome. There is no floor storage during takeoff and landing. 1 D None No Power Seat 1 D is a standard Economy Class seat that may have slightly extra legroom due to the position of the bulkhead. The close proximity to the lavatory and galley may be bothersome. There is no floor storage during takeoff and landing. 1 E None No Power Seat 1 E is a standard Economy Class seat that may have slightly extra legroom due to the position of the bulkhead. The close proximity to the lavatory and galley may be bothersome. There is no floor storage during takeoff and landing. 1 F None No Power Seat 1 F is a standard Economy Class seat that may have slightly extra legroom due to the position of the bulkhead. The close proximity to the lavatory and galley may be bothersome. There is no floor storage during takeoff and landing. 10 A None No Power Seat 10 A is a standard Economy Class seat that has extra legroom due to the exit. 10 B None No Power Seat 10 B is a standard Economy Class seat that has extra legroom due to the exit. 10 C None No Power Seat 10 C is a standard Economy Class seat that has extra legroom due to the exit. 10 D None No Power Seat 10 D is a standard Economy Class seat that has extra legroom due to the exit. 10 E None No Power Seat 10 E is a standard Economy Class seat that has extra legroom due to the exit. 10 F None No Power Seat 10 F is a standard Economy Class seat that has extra legroom due to the exit. 24 A None No Power Seat 24 A is a standard Economy Class seat that may have limited recline. The proximity to the lavatories and galley may be bothersome. 24 B None No Power Seat 24 B is a standard Economy Class seat that may have limited recline. The proximity to the lavatories and galley may be bothersome. 24 C None No Power Seat 24 C is a standard Economy Class seat that may have limited recline. The proximity to the lavatories and galley may be bothersome. 24 D None No Power Seat 24 D is a standard Economy Class seat that may have limited recline. The proximity to the lavatories and galley may be bothersome. 24 E None No Power Seat 24 E is a standard Economy Class seat that may have limited recline. The proximity to the lavatories and galley may be bothersome. 24 F None No Power Seat 24 F is a standard Economy Class seat that may have limited recline. The proximity to the lavatories and galley may be bothersome. 9 A None No Power Seat 9 A is a standard Economy Class seat that may have limited recline due to the exit row behind. 9 F None No Power Seat 9 F is a standard Economy Class seat that may have limited recline due to the exit row behind. Each seat on this aircraft features a Thales i3000 In-Flight Entertainment System- which allows access to various audio options. Each seat on this aircraft features a Thales i3000 In-Flight Entertainment System- which allows access to various video options. On select flights, Air India serves complimentary meals, alcoholic beverages, and soft drinks. This Airbus A319 Version 2 seats 144 passengers in a one-class configuration and is primarily used on short-haul routes. 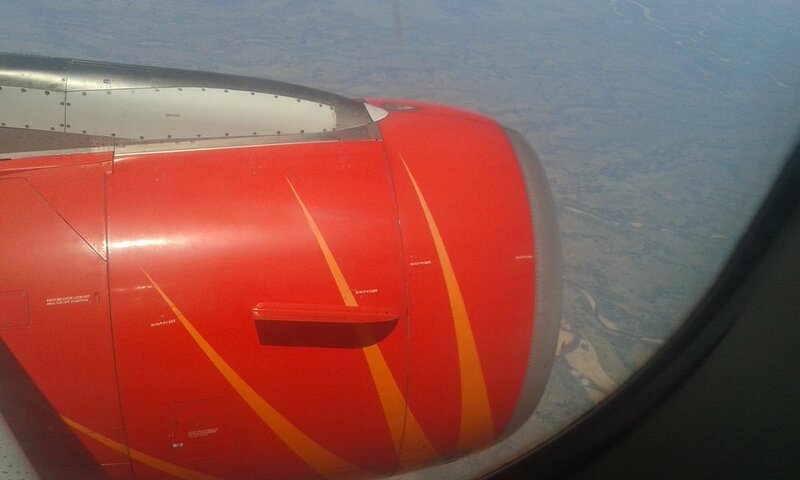 Air India flies 2 versions of Airbus A319.